Per a note from Bill Lobdell at 3:10 today, the Special Meeting called for today to discuss placing Jim Righeimer's Charter scheme on a ballot in June has been CANCELED without further comment. I posted another new post about it. Well, loyal readers, as of 2:50 p.m. Tuesday there has been no response from Lobdell, Hatch or Duarte to my question on this post. I suppose there's still time, but... If I do receive word before I head over to City Hall I'll post it. There was more verbiage at the bottom about not replying to the message, etc. The following is an extract from section 54956 (a) of the California Government Code. I did not include the remainder of the text, only what I feel is relevant to this issue. I have highlighted the section in bold italics the portion in question. You will note that this section of the government code REQUIRES that the call and notice specify the time and place of any such special meeting. Nowhere in your published and posted Notice and Call does it specify the time of the meeting. It does say that it will "begin immediately following the Regular Adjourned Meeting/Study Session", but that assumes the reader of the announcement will know the time of THAT meeting. Since this special meeting deals exclusively with The Charter and the Study Session has no segment on that subject, folks who might be interested in the Charter could not be expected to know about the Study Session. In my view, your Notice And Call has failed to meet the noticing requirements of the California Government Code. If you hold that meeting Tuesday afternoon or evening you will be doing so in violation of state law. good catch! methinks this will stop the vote. yippie missed this one. wake up yippie, the people will NEVER get to vote on this. go find some other mischief to get in to. You may think that you've found a nice technicality, Geoff, but I must remind you that this City Council HAS NEVER LOST A CASE IN COURT!!! I had the same question--how could I not, as I was trying to figure out if I could get to the meeting on time? Anyway, if two laymen noticed the same problem, it's likely that any of the number of attorneys who are concerned with the propriety of the councilmen's actions will also take note. Thanks, as always, for sounding the alarm to the community. Could you do me and other working people a favor and post on Bubbling Cauldron whether the meeting will be held or not? It would make our day a lot less hectic. the time is clearly stated, it will follow the conclusion of the first meeting. When the first meeting concludes is hard to guess since you never know how many "speakers" will show up. To be safe, figure not many and then you won't miss anything. If it runs long get some popcorn from cindy b and robin. can we please get a city clerk to actually perform up to expectations? You must be high as a brick thrower if you think the city has never lost a case in court yet. These boneheads have been trying to get the employee association's case thrown out several times and they keep failing. Are you like Charlie Sheen where you say "WINNING!" when you're really losing? Perhaps you've been drinking their Koolaid and believing everything they say and tell you to believe. They even have a something pathetic called Costa Mesa in a minute. Yeah, a minute of more LIES and SPUN stories! If I get an answer I'll post it on this entry somewhere. Are you kidding? This wrecking crew can't even find a $500 per hour lawyer to perform up to their expectations. What do you expect of an overworked city clerk who continually gets changes thrown at her at the last minute? Don't know if it counts, but they lost last week on their appeal, didn't they? At what point will we be considered a more corrupt city than Bell ? This mess reminds me of when my kids were small and didn't understand "no", and kept asking and asking for a cookie. The only problem is, every time my kids asked for the cookie, it didn't cost me thousands of dollars in lawyer fees. To the City Council: Grow up. No means no-the court has made it very clear. Wait until November. "Legal" is a word doesn't seem to mean anything to these numb-nuts on the City Council. The rented City Attorney is a joke and should have been returned to the funny farm a long time ago. How he can sit there and let these idiots do what there doing is beyond me. Time to suspend acting City Clerk Rick Francis and have the attorneys conduct an investigation. I think the Greg Diamond post was a goof. I was pleased to see the Righeimer Gang lose on the deadline issue recently, but we are nowhere near a point where celebration is in order. The people behind these extremists are very clever, dedicated, and well-financed. With all due respect to our friends in the CMPD, this is a long-term war. Dragging a sign through town or winning one round in court will not be the end of Napoleon Spendboy and his band of idiots. haha! All you little dummies keep debating and arguing with me like master riggy wants you to so I can get his propaganda points and positions out there for everyone to see. The best way to handle a little pony boy like me is to just ignore me and my brothers instead of engaging us in dialogue. If I have nothing to do in Geoff's blog I can get back on my knees at jimmie's house. Time to give up complaining and start campaigning. These guys have proven they are smart and relentless. We still do not have a viable candidate. Yet alone a plan. And Jay said he would not take union money, so we are going to have to find a way to funnel union money. There will be lots of union money to ne spent. Not my post. Nice try. When I post, the name "Joe" comes up in blue. Go back to doing what you do best- bootlicking. let's all be "Joe" from now on! This blog is so pathetic. Any little angle to prevent the voters from voting on something. The haters have become so disgustingly poison in this City. You are beyond the fringe element here. Barry, while we always enjoy your posts here because they give us a clear view into the minds of the bootlickers, if you find this blog "pathetic", please stop reading. I don't want to be the cause of your mental meltdown, for goodness sake! "This blog is so pathetic. Any little angle to prevent the voters from voting on something. The haters have become so disgustingly poison in this City. You are beyond the fringe element here. If it's so pathetic, you should stick to your own blog. What's up? Is it a slow day in the white supremacy community? "Is The Special Meeting Legal"
Geoff you forget, the words Legal and CouncilMEN cannot be used in the same sentence; Legal requirements are not applicable to CouncilMEN. Please consider that requirement in all future columns. (Sarcasm noted). Great job in getting the word out. 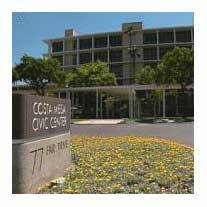 I think a public records request should be sent to the City of Costa Mesa requiring the savings to date be posted by City Spinner Lodbell. Will be a quick response - How long does it take to draw a "0" on a piece of paper? What a group of pathetic losers. No matter what side of the political fence your on can we all just agree due to the new hires w/ pensions at city hall and the unlimited funds being spent by council...THIS CITY IS NOT BROKE and it does not seem we are going broke anytime soon. If that were the case, you would think we would buckle down and save money. At least we should all agree on that! did Geoff just call them bootlickers? After putting down the term haters earlier? double standards here. must realize the sad truth of overwhelming voter approval of charter is only two months away. Judy, they don't have to notify you individually. (think about it and the time to notify everyone in cm. 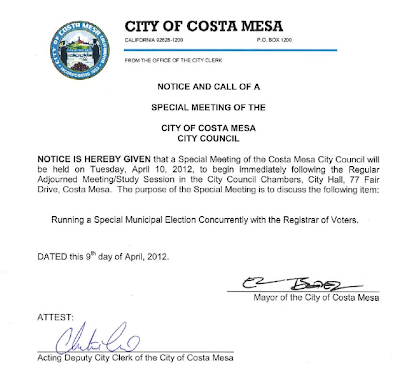 they just have to post it, it is up to you to stay informed) it was a courtesy follow up from the councilmen. Joe, I did not mean to infer that personally expected notice. You clearly misunderstand that I meant the citizens of CM. How can they stay "informed" as u say when blindsighted at last minute and little if any place to find out this happening. Even with say the Daily Pilot, if you were lucky enough to be computer savey u might have read the new article when it was first posted. If you happen too subscribe to the LA Times you would have a copy included. What if you can not afford or chose not to subscribe to a newspaper. By staying informed of the councilmen's shenanigans citizens would need to be in earshot 24/7. I am a concerned citizens, this has been my city, place of employment and where I raised my children but I do have another life, and need my nites sleep. Vote for me, I'm the biggest bootlicker! No, boyfriend, I'm the biggest bootlicker! John Canalis and the Daily Pilot just tweeted that the meeting is cancelled. No explanation. brick thrower: up here in the North County we have this thing called "sarcasm," though some call it "snark" or "facetiousness." Ask Joe or zennymoon about it. But, seriously, I vote that Cynthia Corley wins the thread for comparing Rigthevoteheimer to a kid who just BADLY wants a cookie and will never stop trying getting around the word "no." Just imagine what such a kid could do if he could spend someone else's money on a lawyer!